Whatever view one ultimately takes of Andrew Bent’s political role, there can be no questioning his importance as a practical printer. His career spanned almost a quarter of a century in Hobart and several more years in Sydney. While not the very first printer in Van Diemen’s Land (earlier printers being Matthew Power, Francis Barnes and George Clarke) Bent was Government Printer from 1815 to 1825, and during that decade was the only printer working in the island. Like George Howe in Sydney, Bent worked under extremely challenging conditions in the early years. Through innovation and industry he surmounted the difficulties posed by a small press and unreliable supplies of type, paper and ink to produce work of remarkable quality. He was making do with the remnants of type from original settlement in 1804 and a small supply he had purchased in 1816 from Lieutenant Charles Jeffreys, commander of the Kangaroo. Governor Sorell, soon after his arrival in 1817, implored Macquarie to send down some type from Sydney, but George Howe had little to spare. Bent received a small supply of more modern type in 1820, shortly after Robert Howe had paid a visit to Hobart and which was first used to announce the death of George III in the extraordinary Gazette of 13 Sep. 1820. This was only a supplement to his existing supplies; the newspaper took on a rather patchwork appearance and he could not finally abandon the long ‘S’ until a proper supply of type arrived in July 1823 (nearly two years after it was first requested). There was no proper printing paper and he had to pay a high price for inferior ‘chit’ China paper. This was used for the newspaper as well as some early pamphlets. 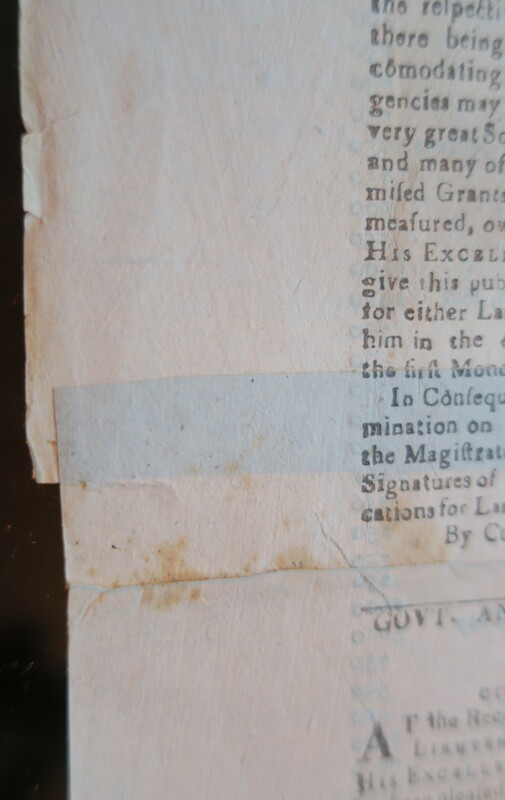 For several weeks in 1819 he (or his workmen) laboriously pasted two small sheets together for each Gazette. Another paper shortage in 1821 saw blue paper used for some copies, although rarely for the complete print run for any weekly issue. A volume belonging either to John Pascoe Fawkner or his father has significantly more blue paper issues than other surviving volumes for that year. Supplements were printed on a variety of different types and sizes of paper, often using up scraps. Bent became proficient at making his own printing ink. Early advertisements suggest that he may have substituted readily available whale oil for the more usual linseed oil, and made his own lamp black (the pigment). He exported his ink to Sydney. He kept up with the latest advances in technology and by late 1821 was making his own composition inking rollers. He had already advertised (HTG 14 Apr. 1821) that he had commenced copper plate printing. In 1823, assisted by his younger brother Richard, a bricklayer, Bent erected the first purpose built printing office in Van Diemen’s Land, and around the same time acquired new type and a number of new presses. He continued to invest heavily in equipment and until 1830 he was probably the best set-up printer in Tasmania, as well as the one with most practical experience. 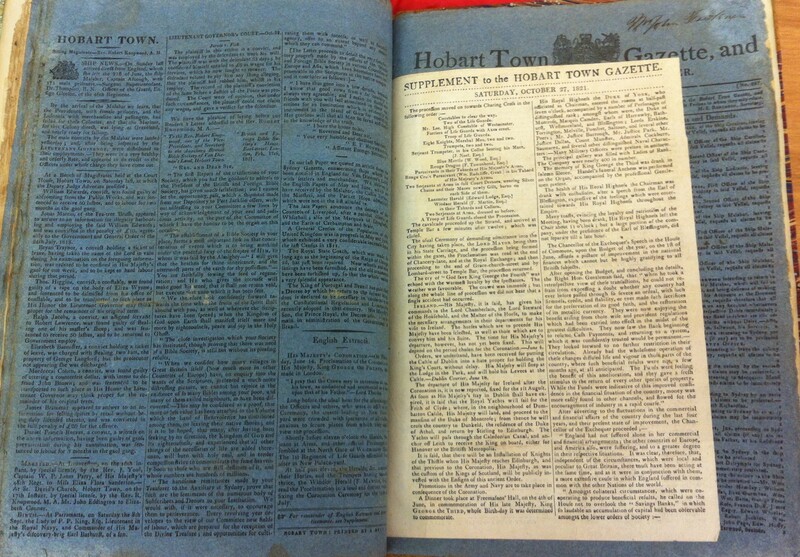 The Hobart Town Gazette, which began in 1816, was the third attempt at at newspaper in the island, but the first successful one, and today, together with his series of almanacs, Bent’s newspapers are an invaluable source of information about the early years of settlement. An impressive list of ‘firsts’ came off Bent’s Hobart presses — the first work of general literature in Australia (1819), first printed catalogue in Tasmania (1820), first Tasmanian almanac (1824), first book illustration in Tasmania, first book of verse in Tasmania (1827), a catalogue of the first library in Tasmania (1828) and Australia’s first book of essays (the satirical sketches of the Hermit in Van Diemen’s Land in 1829). Apart from work done directly for government, Bent printed pamphlets which supported early education and the work of religious bodies such as the Bible Society, and the Wesleyan and other missions. Others, such as those printed for dismissed Attorney General J. T. Gellibrand, former magistrate James Gordon and William Bryan’s associate Thomas Lewis were potent anti-government weapons in the political controversies of their day. A number of pamphlets published between 1827 and 1844 chronicle Bent’s own struggles and canvas issues relating to freedom of the press. There are interesting stories associated with many of Bent’s imprints. His printing office produced a wide variety of forms, handbills and other job printing, much of which has not survived but is documented in a constant barrage of advertisements in his newspapers. For many years much of the book binding done in Hobart was by his workmen. Bent himself stated (BN 29 July 1837) that while working on Bent’s News he often set articles directly into the composing stick without using any written copy (it sometimes showed, editorially) and a young James Fenton observed the same. Bent’s last pamphlets, printed in 1844 and 1849 through the generosity of other Sydney printers, but set up by himself in tiny fonts, show that despite failing physical and mental health, and doubtless poor eyesight and arthritic hands, he had lost none of his touch as a compositor. He always regarded printing as an important and honorable calling and trained his two older boys (Andrew and Robert) to follow in his footsteps. A. Bent, An Appeal to the Sympathies and Benevolence of the Australasian Public. (Sydney: Set-up and printed by the sufferer himself, 1844). J. E. Calder, ‘Something about old Colonists,’ Mercury, March 5, 1881. W. L. Crowther, ‘Excursions in Tasmanian Bibliography: A Further Excerpt: Andrew Bent: 1785c.-1851,’ Biblionews 9, no. 11 (November 1956): 34-36. Paul Fenton (ed. ), James Fenton of Forth. (Burwood, Vic: Educare, 2001), p. 189-90. Ian J. Wilson, ‘China Paper Usage in Early Van Diemen’s Land Printing,’ Quarterly (British Association of Paper Historians), no. 72 (October 2009): 1–7.